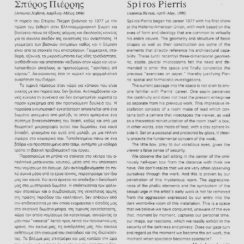 Spiros Pierris began his career in 1977 with his first show at the Hellenic-American Union, with works based on the axes of form and ideology that are common virtually to his entire oeuvre. The geometry and structure of basic shapes as well as their construction are some of the elements that directly reference his architectural capability. These – until recently – three-dimentional geometric, stable, pivotal microcosms felt the need and demanded to enter the space and finally concretise the previous “ exercises on paper” , thereby justifying Pierris’ spatial and formalistic investigations. The current passage into the space is not alien to anyone familiar with Pierris’ career. One easily perceives the continuity and does not treat the present enterprise as separate from his previous work. This impressive installation consists of a room made of lead which contains both a camera that videotapes the viewer, as well as a theoretical miniaturisation of the room itself: a box, in other words, also made of lead, with a clay sphere inside it. Set on a pedestal and protected by glass, it clearly projects the fundamental concern of the work. The little box, prey to our voracious eyes gives the viwer a false sense of security. We observe the ball sitting in the centre of the ominously half-open box from the distance that we think we have. We don’t realise that we are often observing ourselves through the work. And this is actually proven once we enter the mysterious room. The aggressiveness of the phallic elements and the symbolism of the sexual urge in the artist’s early work is not far removed from the aggression expressed by our entry into the dark womb-like room of this installation. This is a space we believe we have conquered unaware of the eye that moment by moment captures our personal time, our image, our reactions which we readily exhibit in the security of the darkness and privacy. Does our gaze turn and regard us the moment we become the art work, the moment when spectator becomes spectacle?